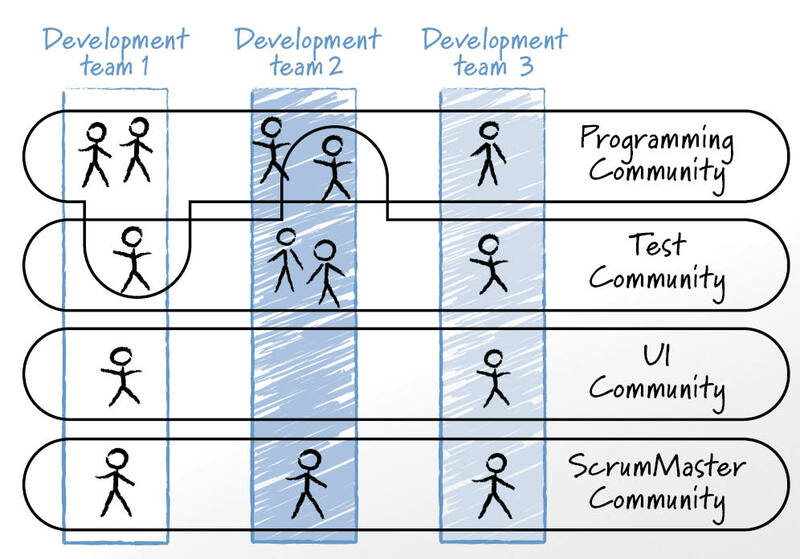 Looking carefully at the diagram, notice both cross team and intra-team (vertical) participation in the "communities" (horizontal). 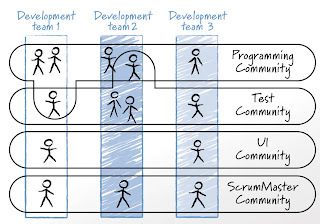 Mike is Scrum-centric, so his diagram has a Scum master community. If I'd done the drawing, I would've been less prochial since there are many competing methodologies, other than Scrum, that provide quite good agile experiences. And, of course, the diagram is only a hint at what you can do. It's probably best to extend this to a program or portfolio. The PMO often instigates and sponsors such collaboration. Many groups call such a matrix "birds of a feather". I have attended many "birds of a feather" collaborations at conferences and such. But Mike is saying: make it a regular and sustained practice, not just an occasional get together. I don't get that Mike Cohn's premise is any different than a matrix organization, as described in Tom Allen's _The Organization and Architecture of Innovation: Managing the Flow of Technology_. Tom describes the benefits and challenges of a properly balanced matrix organization, one dimension being technology focused, the other dimension being market focused. You are correct about matrix organizations: Tom Allen, in the book you cite "The Organization and Architecture of Innovation: Managing the Flow of Technology" on pages 38 -42 describes the traditional matrix, and what Allen calls the "battle zone" of conflict between opposing management teams, and the need to keep a balance so that either the project or the functional organization does not overwhelm. Having been a "battle zone" manager on both sides at different times, both as a functional director and a project director, Mr Allen is very accurate in his description. However, there can not be a true balance else nothing really gets decided. There needs to be a slight weighting to one side. For my money, it's the project side. However, Mike Cohn is not proposing a matrix organization. He is not proposing what Allen describes. He is advocating a strong project that has a outward flow of ideas and experience to "birds of a feather" gatherings horizontally oriented so that persons of common interests can share knowledge and experience. It's kind of like going to Spanish Club after classes in high scool. Diagrammatically, it is drawn as a matrix, but it differs from "matrix organization" in that it is not functionally managed as a matrix. That is to say: the horizontals may not conform to the functional organization at all; they conform to common interests. And, the functional practitioners are not pointing towards the project, as in Mr Allen's diagram (Fig 2-7), but rather the project's practitioners are pointing outward to common gatherings of SMEs with common interests.